You may have noticed that operating systems are currently in a state of transition. Developers are busy working toward the “convergence” of a single code base for multiple devices. The trend commonly referred to as "convergence" is a response to a trend in technology - the shift from desktops and fixed designs, to mobile devices and responsive designs. 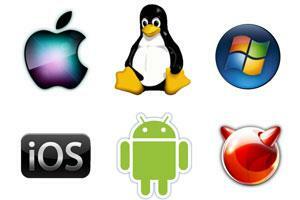 The most popular operating systems for desktops and laptops are Windows, Mac OS X, Chrome OS, and Ubuntu (Linux). But now we would have to include Android and Apple's iOS in the mix of popular operating systems, as touch devices like tablets and smart-phones are gaining in popularity. Google states that Android and Chrome OS will slowly converge. The convergence of operating systems can also be seen in the iOS-ification of OS X, and Microsoft's Windows 8 hybrid Desktop / Metro user interface. In the Linux community Canonical is working towards converging Ubuntu with Ubuntu Touch. "Convergence" can be noticed in the latest trends in web-site design as well. Currently many developers are taking a mobile first approach and incorporating responsive designs. This is one of the reasons why we are noticing a shift to a minimal, less is more, approach - in an effort to accommodate more devices with a single code base. Longing for the good old days of Windows 7, Aero features, and the Start menu - some respond by disabling new features and adding old ones. I too was skeptical, but have been experiencing a change of heart, as I personally like the convenience of a tablet and smart-phone, and welcome the day more applications have transitioned to touch and voice activated interaction.